The Employment Cost Index rose to its highest year-over-year pace of the expansion in Q2. Employment costs at private businesses have risen 2.9% amid a more rapid rise in wages and benefits. Public sector costs have been more subdued, however, as wage growth has slipped back under 2.0%. For all the hand wringing over slow wage growth in the current cycle, there is a clear upward trend in compensation costs over the past few years. While total compensation growth remains below the previous cycle’s peak, this make senses from a fundamental standpoint given lower levels of productivity growth and inflation. The ISM manufacturing index cooled a bit in July but remained firmly in expansion territory at 58.1. Most sub-indices moderated over the month and, along with comments from respondents, hint that the recent trade environment has begun to impact activity. The current production component edged down, and new orders fell to the lowest level in a little over a year at 60.2. That said, orders and activity are still at fairly high levels, and the modest slowdown of late does not look problematic for the overall growth picture. Similarly, the consumer confidence index was only slightly down in June and July relative to May despite rampant headlines over the past two months about a possible trade war. US employment data for July were released this morning. Nonfarm payrolls growth disappointed with a 157,000 print, below the 193,000 Bloomberg consensus estimate. The net revisions over the previous two months were +59,000, however, softening the blow of the miss. Manufacturing payrolls were particularly strong, rising 37,000 in July, the fastest pace of 2018. The unemployment rate dipped to 3.9%, while average hourly earnings were unchanged at 2.7% year-over-year. One encouraging sign was the broader U-6 unemployment rate, which counts those working part-time for economic reasons and those who want a job but have stopped looking, reaching the lowest level since 2001. The Fed elected to remain on hold at its August meeting. In a way, the FOMC upgraded its assessment of the economy compared to the statement that was released at the end of the last meeting in June. When describing growth, the FOMC upgraded its characterisation of the pace of economic activity from “solid,” which it used in the last policy statement, to “strong.” Trade tensions continue to lurk in the background for the Fed, but with inflation more or less at target and economic growth proving robust, the Fed is expected to hike twice more this year in September and December. On the trade front, the US and EU have called a truce on further tariffs, but tensions with China continue to escalate. President Trump ratcheted up pressure, as his trade team received marching orders to assess the possibility of more than doubling the rate of proposed tariffs on China (from 10.0% to 25.0%). China has warned that such actions will not go unpunished and has vowed to retaliate in both scale and severity with measures of their own. In fact, the Chinese government has already announced $60 billion worth of US goods on which retaliatory tariffs would be applied. The broader US stock market benchmarks were generally positive for the week as Apple led the information technology sector out of a brief slump. Mid-cap stocks performed the best, while the narrowly focused Dow Jones Industrial Average, which tracks 30 large-cap companies, lagged. Stock investors were focused on a slew of second-quarter corporate earnings reports that were released during the week, but macroeconomic news was generally supportive. An escalation of the trade dispute between the US and China seemed to have minimal impact on US equity markets. A sell-off in tech stocks from the previous week carried over into trading on Monday. However, Apple ended the downward trend for the sector with a strong earnings report on Tuesday. The computer and device maker beat market expectations and reported a 40.0% year-over-year gain in earnings per share. Apple became the first company to reach the $1 trillion market capitalisation milestone after its stock rallied more than 8.0% in the two days following the earnings release. The yield of the benchmark 10-year Treasury note was little changed for the week. The 10-year yield was at 3.0% at the close of trading Wednesday (the first time it has closed at or above the 3.0% threshold since late May) as news of increased borrowing by the US government in the second half of the year may have dimmed investors’ appetite for Treasuries. However, the Bank of Japan’s decision to keep its accommodative monetary policy in place and concerns about rising trade tensions increased demand for safe-haven securities and helped drive yields lower by the end of the week. The Monetary Policy Committee (MPC) of the Bank of England (BoE) decided to raise the policy rate by 25 basis points to 0.75 % at today’s meeting. The MPC also decided to keep the QE programme unchanged. The decisions were unanimous. The decision to raise the policy rate was in line with market expectations. According to the BoE, the near-term outlook had evolved broadly in line with the MPC’s expectations. Although the global outlook was a little softer, recent data appeared to confirm that the dip in UK output in the first quarter had been temporary, with momentum recovering in the second quarter. The MPC’s assessment was that the labour market had continued to tighten and unit labour cost growth had firmed. 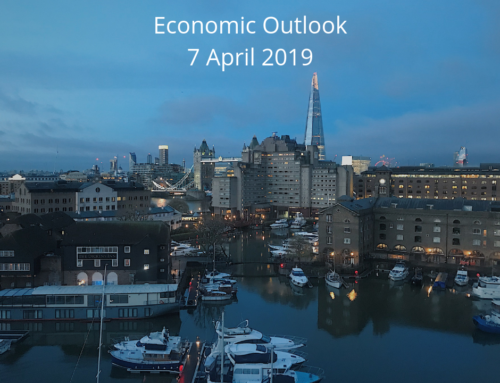 The BoE still expects annual GDP growth of around 1¾% ahead, and inflation is expected to stay a little above 2.0% before returning to target in 2021. On the margin, the August inflation forecast was slightly higher than the one in May as a result of a weaker pound. Britain’s construction industry unexpectedly gained momentum last month to grow at its fastest rate in over a year, boosted by the biggest increase in housebuilding since the end of 2015, an industry survey showed on Thursday. The IHS Markit/CIPS construction Purchasing Managers’ Index (PMI) rose to its highest since May 2017. The PMI jumped to 55.8 from June’s reading of 53.1, beating all forecasts in a Reuters poll of economists that had predicted a slight slowdown in growth to 52.8. UK households are accumulating billions of pounds of debt via credit cards, overdrafts, and personal loans at record levels in a trend that economists are warning is unsustainable as interest rates rise, according to the Office for National Statistics. Years of weak wage growth and a recent rise in inflation have led consumers to borrow huge amounts of unsecured credit to sustain their normal spending over the past year. Figures from the BoE showed that households borrowed £1.6 billion in unsecured credit in June, taking the amount of borrowing that is outstanding to a record of £213.2 billion. In China, the manufacturing PMI from Markit fell to 50.8 in July from 51.0 in June, whereas the official manufacturing PMI fell to 51.2 from 51.5 in June. Both outcomes were marginally weaker than expected by consensus. Both indicators also fell last month and the direction (now clearly downward) is in line with the slowing of overall growth in China’s economy. The sub-index for new export orders was unchanged in the official reading but fell somewhat from an already low 48.8 to 48.4 in July. This suggests some negative impact on exporters’ sentiment from Trump’s 25.0% tariff on selected US imports from China that took effect on July 6, even though the recent weakening of the CNY supports exporters. The Chinese yuan posted its eighth weekly loss as trade tensions with the US showed no sign of easing, stoking worries that the deepening rift would weigh on China’s slowing economy. The yuan hit a 14-month low on Friday and gave up nearly a percentage for the week, pushing the currency closer to the psychologically important exchange rate of 7 yuan per US dollar. The yuan’s eighth straight week of declines marks its longest losing streak since China created its current exchange rate regime in 1994. The yuan’s drop against the dollar has accelerated since mid-June as trade tensions between the US and China heated up. On Friday, the People’s Bank of China (PBOC) made it more costly for investors to bet against the yuan by imposing a hefty reserve requirement on the trading of some foreign exchange derivatives, Bloomberg reported. The move signaled the central bank’s concern about the yuan’s protracted weakness, which has in the past spurred large capital outflows with potentially destabilizing consequences for the Chinese economy. In the EU, the plethora of important data out showed a cooling economy and steady unemployment but slightly higher inflation. Overall, the figures will most likely reassure the ECB that it is taking the right approach in its current stance of a very gradual and careful removal of monetary stimulus, but a more marked downturn in the economy will be necessary for the ECB to deter from ending its asset purchases in December. The reaction to the figures in FX and fixed income markets is expected to be relatively muted, as the stronger inflation outcome to some extent should be balanced by the weaker-than-expected growth outcome. GDP growth unexpectedly slowed to 0.3% quarter-on-quarter in Q2, which was below market expectations (0.4%) even though the slightly weaker national data available prior to the release might have lowered expectations somewhat. That was the weakest growth rate for the euro zone economy in two years, and comes as budding signs that uncertainty due to the threat of a trade war is beginning to have some impact on the economy. While GDP growth cooled, the flash estimate of inflation ticked up from 2.0% to 2.1% in July, which was a touch above expectations and a step further above the ECB’s goal. The uptick seems to mainly reflect an uptick in core inflation with an increase from 0.9% to 1.1%, which was also above the expected increase to 1.0%. The unemployment rate held steady in June at a downwardly revised 8.3%, but there was a slight increase in the number of unemployed persons, which to some extent fits well with the more moderate growth picture. Unemployment rate is expected to stay on a downward trajectory for the remainder of the year. European equities ended the week lower as rising trade tensions between the US and China once again weighed on the markets. Investors were apparently nervous about the Trump administration’s threat to raise tariffs from 10.0% to 25.0% on $200 billion of Chinese imports and equally concerned that China responded that it would retaliate. Basic resources stocks were hit the hardest midweek. Automobile and oil shares also tumbled. Sources: Wells Fargo, TD Economics, T. Rowe Price, Reuters, Handelsbanken Capital Markets.